Activates and Holds Solenoids Open. Generates and Traces 1Khz Tracing Tone. Checks Clock 24v Power Output. Tests for Open or Shorted Wiring. The Pro-48K TechTool Sprinkler Solenoid/Clock Checker Kit is the must have basic tester kit for irrigation professionals. 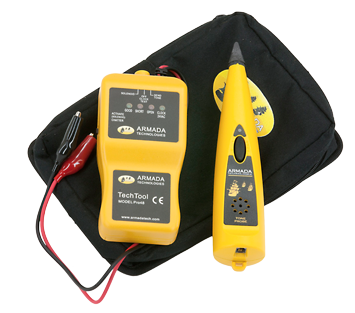 Included in the kit is a model Pro-48 Solenoid/Clock Checker, a Pro-200 Probe, a Pro-21 Case, and a User Guide. The Pro48K TechTool Sprinkler Solenoid and Sprinkler Timer Checker is a new low cost test set for irrigation contractors and maintenance personnel. 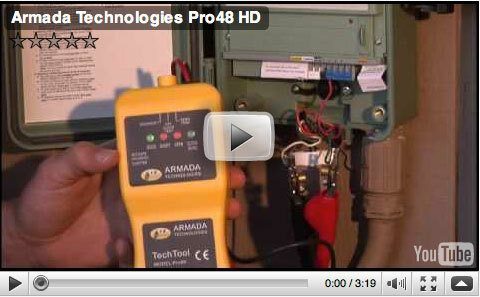 The Pro48K performs a series of simple procedures to test, verify, and identify solenoid, wire, and timer problems. Sprinkler solenoids can be checked using either activation or chatter modes. Lost or buried solenoids are quickly found as well by listening for the chatter. Wiring can be verified and tagged with the built in tone generator function. Sprinkler Clocks also are tested for proper 24v transmission with a simple LED power check. Made from a grommited, thick walled plastic case, the highly visible yellow Pro48K TechTool Sprinkler Solenoid Activator is designed for rugged use in the field.